A South Park neighborhood character who insisted his real name was Elvis Presley died in this alcove in 2012. He was run over by an emerging car, whose driver was cleared of wrongdoing. Another man died the same way in December 2014. My old blog has some details about the design flaw that I posted after Elvis died. Also about Elvis himself, who was a skilled street mechanic before his addictions got all the way in the way. In the meantime, the subject of “unfriendly architecture” has come up strongly in public debate about heartlessness in public spaces, mostly by way of some especially ugly-looking spikes placed by London property owners outside an apartment building and a Tesco’s. A little farther down in this blog is a link to a Storify about that with examples of anti-sitting/anti-sleeping design in San Francisco and elsewhere. 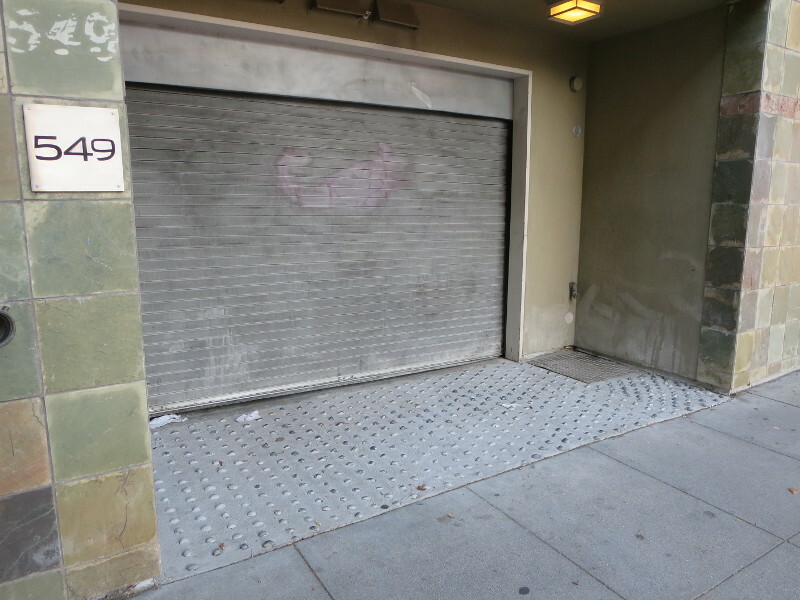 So the reason I mention spikes is, the picture above shows a recent addition to the rain-sheltered garage entry alcove where two men have been run over: they’ve added pebbling to the pavement to discourage sleeping. And this is why it seems worth asking: are spikes the problem? This entry was posted in Public Space, San Francisco on March 14, 2015 by Martha Bridegam.